Here are just a few of the books you can look forward to in January. I can't wait for Knitting in the Details in particular! Knitting Today - New Magazine! Their premier issue was for November/December 2010. Of course, I picked it up as well as the latest issue, for January/February! I think this magazine has promise. The first issue features holiday patterns, such as Garland Lights designed by Jaqueline Milles, and some really cute ornaments designed by Clare Scope-Farrell (gingerbread man, bauble, and candy cane), plus other great patterns. Also has a book review section called Book Nook, Expert Q/A by Shannon Okey and of course, the standard 'basics/how to' section in the back. Their second issue, the Love Issue, has some cute patterns for Valentines such as the Double Knit Heart Scarf designed by Marina Salume and Heart Hat designed by Jaqueline Milles. You can get a free pattern for some adorable little stuffed hearts here. Along with the Book Nook and Expert Q/A this issue has some great patterns, such as the Camel Cape designed by Jaqueline Milles and Alyce Benevides and the Boyfriend Cardigan designed by Elena Malo. AND, visit the website for your chance to win a copy of Modern Top-Down Knitting by Kristina McGowan. Enter by January 11, 2011. Don't forget to download the extra patterns available online! If you are a subscriber, all you have to do is enter your email address for the extra patterns. If you are not a subscriber, just enter the code from page 4. I've just finished poring over this issue, and thought I'd mention a few of the things that caught my eye. First, on page 42 the Garden Party clutch, which has flowers knit with Kidsilk Haze and Swarovski bead centers designed by Nicky Epstein. (The flowers are attached to a purchased handbag) Personally, I don't ever carry a clutch/purse/bag, but I think these flowers would look pretty on the corner of a scarf or wrap, or even a felted hat. The Cabled Swing Poncho on page 65 looks super cozy! This has a hood and pretty cable pattern, designed by Michele Wang. Knit in Zealana's Aspire Tui, the poncho also features knit-in slit pockets. I love, love, love the Ruffle Scarf on page 82 designed by Brooke Nico. Knit in Misti Alpaca Lace, very feminine. The Entrelac Scarf on page 83 is gorgeous! Designed by Rosemary Drysdale and knit in Filatura Di Crosa/Tahki Stacy Charles Baby Kid Extra. Beautiful! Happy Friday, fellow knitters! I have decided that tonight will be my Girls Night In. It is cold, gray and nasty out, so it's the perfect night to snuggle up with a good movie, knitting, and some hot cocoa! Who doesn't love a Cinderella story?? I also love Drew Barrymore.... and Dougray Scott ;-) I suppose I am still a kid at heart, because this is one of my all time favorite movies! I don't think there is really any explanation needed - Ever After - A Cinderella Story is a contemporary re-telling of Cinderella. Angelica Houston also stars as the Wicked Stepmother, and she is great! I hope you will also find some quiet time for you and your knitting. Until next time, Happy Knitting! As promised, here are a few more noteworthy patterns for Christmas. Enjoy! A review of Vogue Knitting Fall 2003 issue, by me and a review of the Fall 2010 issue by my sister (She has her own crafty blog called Stitches N Purls). A link to Vogue Knitting can be found at the top of the blog - you can subscribe as well as purchase back issues. Be sure to sign up for the news letter too! There is a super neat new app for the iPod Touch and iPhone called Knit-n-Count. I decided to splurge and pay the $1.99 to download this app. It counts rows as well as pattern repeats, and you can even set an alarm to go off to remind you to do a certain stitch at a particular point in the pattern. If you need to frog a few rows, no problem; the app will help you keep track of that also. You can enter up to 10 different projects at a time, along with the name of the project and any notes you might want to jot down. Great for designing your own patterns, IMHO. Here is an article about the app. It is that time again already! The year has flown by - soon it will be 2011!! If you are looking for some Christmas-y knitting patterns, here are a few to get you started. I will be posting some more links the next couple of weeks, so come back soon. And if you have any to contribute, feel free to leave a comment. Realized that I left a part out of the end of the pattern. Nothing major, just left out a bit of seaming :0) I have corrected this on Scribd, (it appears in red on the document), and is also listed below. My apologies. Finally, finally, finally! I have posted the pattern in it's entirety on Scribd in a handy dandy PDF - you can find the link on the Mystery Knitting Patterns page at the top of the blog. Or, click HERE. It is rather wordy and has pictures, so I have decided not to include it with this post. So head on over to Scribd and get this stupid UFO off the needles! At some point this week, I will also be putting a video up on my YouTube channel demonstrating how I finished the project, because while the written directions make sense to me, they may not to someone else even though I did my best to be clear. Hopefully the pictures are helpful in the meantime. The podcast sponsor, Lydia Marie, is at the Pittsburgh Mills craft show in Tarentum PA this weekend. 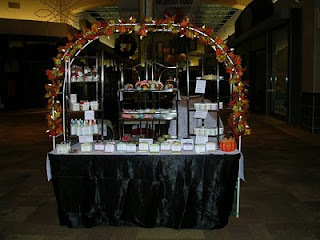 If you live in or around the area, stop by to purchase some fabulous hand made soap or lotion! Taking a break from putting the finishing touches on the 2nd Mystery Project (which will be posted very soon!) to share this cute tid-bit. Last week, I was in the grocery store. I always check the magazine area, incase there happens to be anything of interest. It is pretty much hit or miss; if there is a hit, I would much rather grab it than have to pack up the baby and drive aaalll the way out to the book store, even though I have a discount card for the book store. Anywho, as I was perusing, out of the corner of my eye I noticed someone else. I didn't turn around, but rather, figured they could wait until I was done looking to have their turn. (Polite, aren't I?) As it turned out, the lady happened to be rather nice. She was older - the grandmotherly type. Since I was looking at the needlecraft section, she asked if I did needlework. 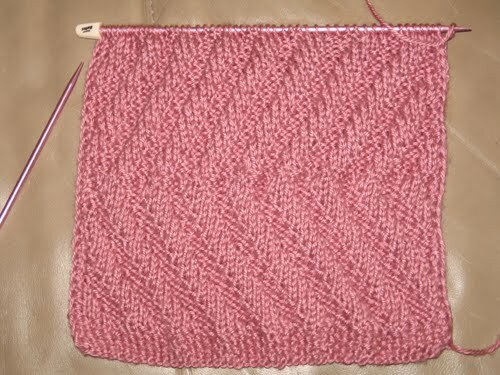 In addition to the pattern from Plymouth in the previous post, here is a scarf from Classic Elite to knit for breast cancer awareness, (it is the same as the one I posted last year) as well as a few others. If you have a pattern you would like to share, feel free to post a comment with info. 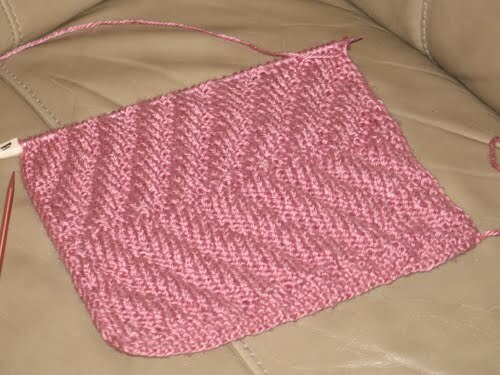 Classic Elite Scarf --- Also from Classic Elite, here are a few more pink patterns. You can also purchase a pink Denise Interchangeable Needle set! I finally have my computer back, however the Internet access is intermittent at best. So, while it is working, I will gab about a few things really quickly about what's coming up. I REALLY want to get Episode 9 recorded before the end of this month! I have oodles of things I want to talk about! For now, I just want to give a shout out to Evelyn at Knitty Noddy. I will admit, I was kind of hesitant about ordering from a place I am not familiar with, but the price was so good I just couldn't pass it up. I will definitely order again once my budget permits. Fast shipping, and fabulous customer service!!! I received a personal email from Evelyn, thanking me for my order, etc. I recommend buying from her if you are in the market for any yarn, needles or patterns. 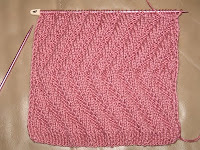 I am adding Knitty Noddy to the yarn page at the top of the blog. This is a great site I found whilst looking for a good deal on Handmaiden Sea Silk yarn. I am in love with this yarn, and will review it in the near future. I purchased the color Pumpkin - very appropriate for this time of year, no?! I started A Handsome Shawl from Victorian Lace Today. I am so excited to be knitting this shawl! This is my first endeavor into a real, serious lace project and the Sea Silk is perfect!! I have already hit a few snags though and I haven't even finished one repeat of the pattern. Did you know that accidentally picking up 2 yarn overs from 3 rows down can really mess things up??? I sure do now! Fortunately, that was a super easy thing to fix! And last night, I finally had a bit of time to myself so naturally sat down to work on the shawl. Of course there had to be a huge, massive gob of yarn barf which is almost hopelessly tangled. So I spent an hour trying to pick it out. I guess I wound it funny, and in the process of pulling out the yarn to knit, it became tangled inside and then all came out in a great big mess. I am determined to get the tangle out!! Are you in to reading knitting fiction? I've read a few books, my favorites so far being the Blossom Street series by Debbie Macomber. The first in the series is The Shop of Blossom Street. Lydia Hoffman/Goetz is the main character. She opens a yarn store in Seattle called A Good Yarn, which she holds knitting classes in. These books mainly focus on the people she meets at her classes. A very nice series! I like all of the characters, and the situations they find themselves in are actually pretty believable. At the bottom of the blog you can check out the books from Amazon. There are also books of knitting patterns to go along with some of the books! Also, as you may know, October is breast cancer awareness month. Get a free pattern from Plymouth Yarn - click HERE! OK, that is about all I have time for now. I'll be back soon; until then, Happy Knitting! 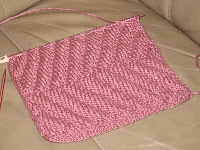 Next 20 rows: sl1 as if to purl, k1 *yo, p2 tog* to last 2 stitches, k 2. Then, repeat rows 31-42 twice. Then, repeat rows 7-18 twice. Hello fellow knitters! The last month or so has been very hectic for me! So as not to bore you, I will keep the details to a minimum, and then get right into the knitting stuff. As you may know, I previously mentioned that I was expecting at the beginning of August. Well, that turned out to be the end of July instead! Just a minor problem on my part, I was put on bed rest and baby had to come a little earlier than planned. Fortunately, I was far enough along that she was not considered a preemie, and there were no health issues. And then of course, there has been the adjustment period for me - nobody tells you just how difficult and frustrating the first few sleepless weeks with a new baby can be! Fortunately, I had my mom to help out a little bit, and now baby and I are getting into a routine and things are much easier. Whew!! I've been making some changes to the blog, as you may have noticed if you have been here before. Just trying to make things easier to navigate and the like. There are many more changes I want to implement, and will be doing so as time permits. Also, I hope to make some more YouTube videos at some point in the near future. I really want to figure out how to make better quality videos, so if anyone has any tips for me, please let me know!! I have been able to find a little time to work on my knitting, but not much. I have desperately been trying to complete the next part of the 2nd Mystery Knitting Project, and am happy to say that I am almost there! I have a new book to review, plus some others due to be released soon I want to talk about. That I am saving for the podcast; other things I want to talk about in the next show are below. I am not certain when I will find the time to record the next show, so for now this is it. Well, I finally have enough energy this morning to get a few of the things together that I've been wanting to talk about since the last episode. I have no magazines to review this episode, mainly because I have not read one single magazine for months! I have been buying them, and have started a collection on the coffee table that just keeps getting higher and higher. I know I am missing out on some great tips and yarns and patterns, so I hope to feel up to digging into them soon! In the past episodes, I listed each magazine in the corresponding blog post with a link to the web site for each magazine. I have decided to just add a list to the side of the blog of the magazines I typically read, along with any others that I happen to come across I think you may find interesting. I still plan to talk about magazines in future pod cast episodes, there will just not be a link within the blog post. If you are interested in a magazine, you can just follow the link in the side bar. I will try to have that done as soon as I can. I know it has been forever since I posted a new podcast, or comment... or video. I had so many plans and ideas, but have gotten very side tracked. With good reason, though. But first, I did have a question. What kind of yarn did I use in my "Elongated Stitch video? Just plain old Lily Sugar n Cream cotton yarn. Ok... so why haven't I been around lately? Well, you might have guessed if you have scrolled down to the bottom of the blog recently. Around the end of November / beginning of December, I started getting extremely tired. So tired that I was falling asleep around 8 PM and still could barely drag myself out of bed in the morning to get to work on time. On the weekends, I was sleeping in and as soon as I got up, I would sit on the couch and almost immediately fall asleep again. That is so not me.